This year has (so far) been good for the frogs... they are certainly keeping busy. We had a brief hailstorm yesterday, but none of ithe spawn has gone milky, which is always a bad sign. I'm hoping it will be alright, because a lot of it was lost due to late cold weather last year. Well we are way behind everyone else 'down south'. Having not seen a single frog we did find a load of spawn in our flooded ditch area. My handyman, got a bucket and move half to the pond, along with sludge and some greenery. What surprised us was when this was tipped into the pond, it turned upside down and the bottom layer of spawn was white, the top had seemed perfectily normal. We wondered if, due to the still frosty mornings, the lower layer had frozen and what we were seeing was more spawn laid on top? What I mean by white was each individual spawn had white presumably dead tadpole. Anyway keeping an eye on it. Found c10 clumps of spawn in the LNR at Ruislip but no signs of amphibian activity at the other ponds. Wonder whether last year's drought has had a negative impact. No sign of any further activity in my garden with just 2 spawn clumps so far + looks like it for the year. 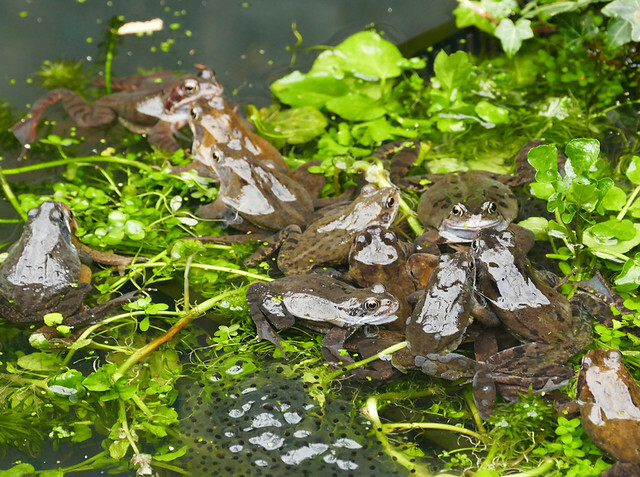 Last year had at least 20 frogs at spawning time. Only seen one frog, half eaten. However, much to my delight. Two clumps have appeared in the pond and no where near where 'handyman' had put the spawn he had transferrred from the ditch. 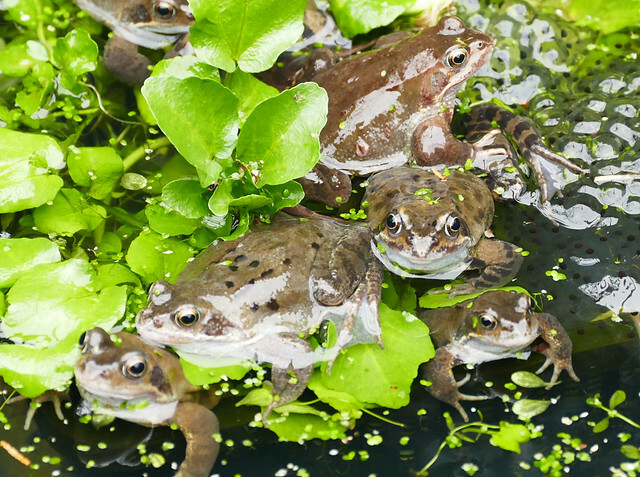 This means that the frogs that did emerge from the pond last year, have come back to spawn. Strangely some of the spawn seems to be disappearing. It's not going white or cloudy- the clumps just don't seem to be there any more. I can see tadpoles developing in what is still there, but they are no where near fully formed yet. Still quite a few frogs down at the bottom of the pond, but I can't see any in amplexus now. Perhaps that's it for this year. I don't think we are going to have as many tads as I initially thought we were. We now have taddies but the toads have not developed yet. YOur spawn might be disappearing beacsue it is being eaten. This morning a mallard was having a good old fest on the spawn and the taddies.